On a rainy afternoon in Kansas City, Jay McShann (one of the few survivng greats from the Charlie "Bird" Parker era, lead three Kansas City jazz icons, Michael T. White, Tommy Ruskin and Milt Abel, back in time to recapture the sound that was and is Kansas City jazz. This album is the result. A musical happening that captured a moment in time - preserving it for eternity. Music is Kansas City's heritage and we have the responsibility of preserving and protecting that heritage. The Kansas City Star, through their generous funding of this project, made a significant contribution to that heritage. Net proceeds of the sale of this album will be donated to Project Warmth, under the joint sponsorship of KCTV Channel 5 and the Kansas City Star. 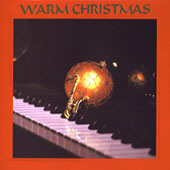 Buy Warm Christmas now at Amazon !